Do you need a solstice record? Got you covered. For years now, Montreal’s No Aloha have been putting out quality material like it’s an easy thing to do. The newest collection of rhapsodies, Deluxe, stands the N.A. test: quality, originality, and sick vocals. Production comes and production goes, but these guys always seem to know where to put it and how often. While last year’s No Problemo felt like the next trot up the stairs from the band’s earlier work, 2016 has obviously brought a change in the state of sonic affairs for No Aloha. There is a greater space built into the sound — more room for the drums to ricochet out, for the bass to twirl hypnotically (as on droning opener outro “Greenout”), and the guitars to get fat gutted and jump around wildly. This is not a hard, ninety degree turn in the group’s sound, but the bend is noticeable, and fun to observe. There are things in this record that people will adore: outros that seem to stretch through alleyways, into secret places — see “Dud”; the Brexit logic of “Generational Divide” (grrrrrrrr); the kind of tourism usually reserved for the inside of Frank Black’s skull — now finding a pretty little home in “Trips” and all the graveyard inner eye burning that comes in tow. 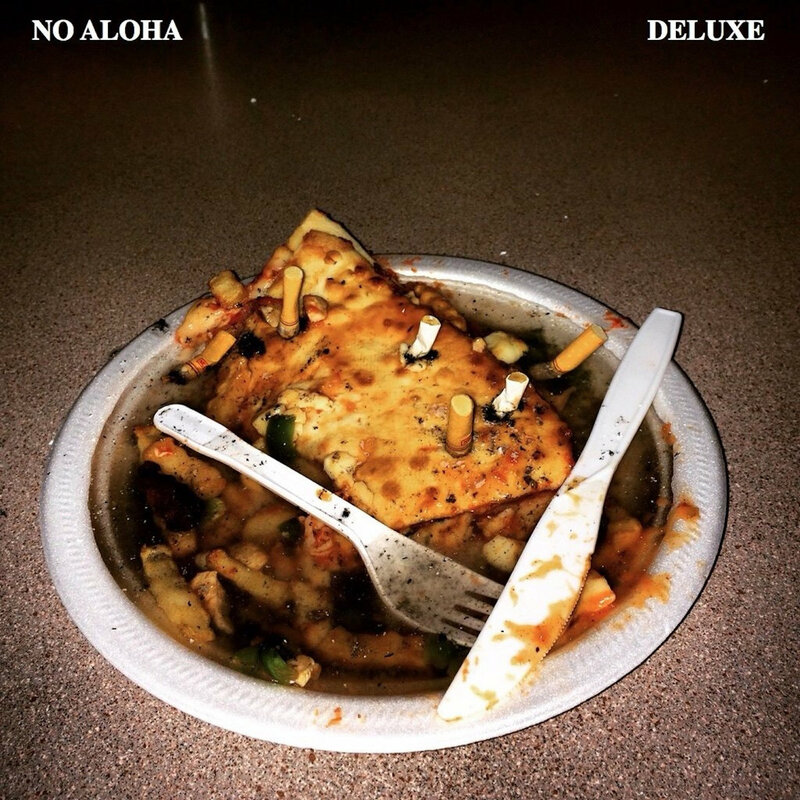 The most intriguing thing in the newest incarnation of No Aloha is how they seem to get more bluntly punk and more sophisticatedly pop at the same time. Things slow down, then foment into rasping chaos. “It’s So Easy” sounds coiled up as it starts, as if ready to burn a village down, but not just yet; then the guitars take off, launching into psychedelic Mars riffs. “Shoulda Woulda Coulda” is another perfect example of this new, ranging duality for the band. A mouthful of words and guitars, noodling and grinding to a strange hop from the rhythm section, the song de-evolves into a Ramones roll call of party declaration, then re-de-evoles into guitar soloing and a triumphant hack at a classic rock finale. An interesting thing to note on Deluxe. While previous releases featured grand stacks of vocals on the majority of the tracks, No Aloha has stepped away from that. With three distinct songwriters, this stoicism of voice leads to greater focus on the words. And with tracks like “Generational Divide,” “Trips,” and “Montreality,” nothing could be sweeter. A quick one word note on the drone/bass drum paean that is “Season of Light:” yeaaaaaaaaaaaaaaaaah. The album is out for July, 2016. The heat, the sun, the chances for mischief, everything works with Deluxe. And if you find yourself stranded in Montreal, or anywhere along the Great Generational Divide, with the sun coming up this summer, you can smile knowing there are gentlemen in Canada crafting songs for that exact moment. And they’re doing it very well indeed.